iPhoto users looking for a more robust photo management system don't have to search any farther than the just-released Aperture 2. There are a number of reasons why this is a logical transition. Creating Referenced Files to Your iPhoto Masters: If you hold down Command+Option while dragging from the iPhoto Browser to Aperture, you'll reference the imported images... no duplication. So you get to use your iPhoto images in Aperture without making extra copies of them. Moving iPhoto Albums into Aperture: You can bring in entire iPhoto albums by using Aperture's Import command, choose Images from the pop up menu, and navigate to your iPhoto Library container. When you click on it, Aperture will show you all of your albums. 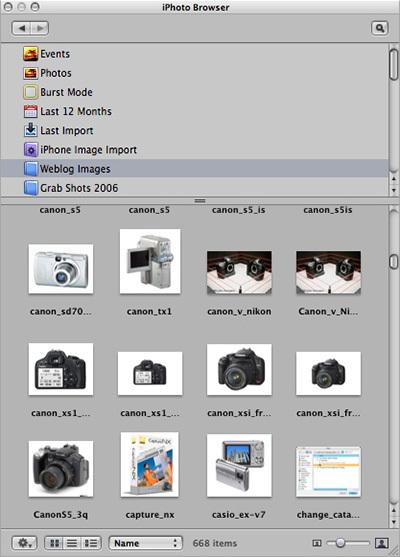 Choose an album, and Aperture will import it and place it as an album within your selected project. Empty is this month's photo assignment. Empty spaces, empty containers, empty lives... lots of possibilities for this one. You can read more about how to submit on our Submissions page. Deadline for entry is Feb. 29. Now, if I shoot in nothing but raw, is Aperture a must? Because I know I hate the way I have to edit in iPhoto. This was an amazingly helpful podcast. It seems it doesn't matter if you're podcasting from your studio or your hotel room, the information is clear, concise and exceedingly practical. Thank you ever so much, Derrick. I just ordered a mac and a new dslr. I prefer shooting in raw. I've heard iPhoto sync the photos from the cam, in raw, but converts them automatically in jpg. That's not what I want. Is there a way to import the raw pics to aperture, save in jpg, then only save in the iphoto library, because it seems above you showed the opposite, how to import from iPhoto to Aperture. Great info about moving from iPhoto to Aperture, thank you. Would loooove to hear what you'd do to move from iPhoto to Picasa for Mac.